This extremely unique Dining Table will change the way you think about modern dining. The piece features an exceedingly functional integrated leaf system, where the 31.5" leaf will automatically rise when you pull the table end and then fall back into place when you push. Not only is it functional, but it allows you to seat plenty more of your friends and family. Finally, choose between the T100 or T200 leg style, as well as one of three different wood finishes to create the look you love most. 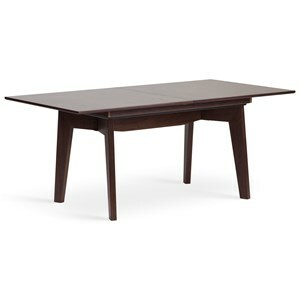 The Madeira Dining Table with T100 Leg and Integrated Leaf by Stressless at Hudson's Furniture in the Tampa, St Petersburg, Orlando, Ormond Beach & Sarasota Florida area. Product availability may vary. Contact us for the most current availability on this product. Leaves Includes Integrated Leaf at 31.5" to Extend Surface from 69" to 100.5"
Warranty 10 Year – We guarantee the internal mechanism of our Stressless® Dining tables for a period of 10 years from the date of purchase of the product. The 10 year guarantee covers the system for opening and closing the tables, locking device and the function of the integrated leaf. It does not cover any faults or damage caused by the use of the product other than in accordance with the manufacturer‘s recommendations, as well as any faults or damage arising from the normal wear and tear of use, improper care, damage caused by accident or any repairs made by any persons not authorized by the manufacturer. Browse other items in the Madeira collection from Hudson's Furniture in the Tampa, St Petersburg, Orlando, Ormond Beach & Sarasota Florida area.